I mentioned before that the curved turnout on the ramp from staging didn't want to play ball with BR24. Today I ran that locomotive over the spot where it got stuck consistently two weeks ...uh, a month ago, and sure enough, just like last year, no problems anymore. However, since BR24 has the pickup shoe below the locomotive, and the loco frame is quite a bit more open than the tender of BR50, I could actually observe what the pickup show is doing as it glides across the turnout. At one point, right above the pivot of the turnout points, the pickup shoe drops and then gets lifted up again. Even closer observation showed, that there is potential for the pickup shoe to slip off the raised point contact in the area, and then get caught in the next middle contact. To work around this problem, I super-glued a small piece of styrene into the turnout that should keep the pickup shoe out of the "hole" and in line with the top of the point contacts. The ramp from staging comes from the right. 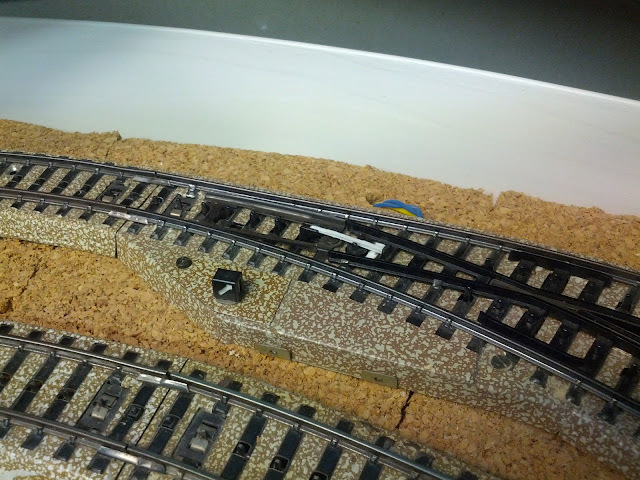 Yes, all of staging is built with Maerklin M-track.